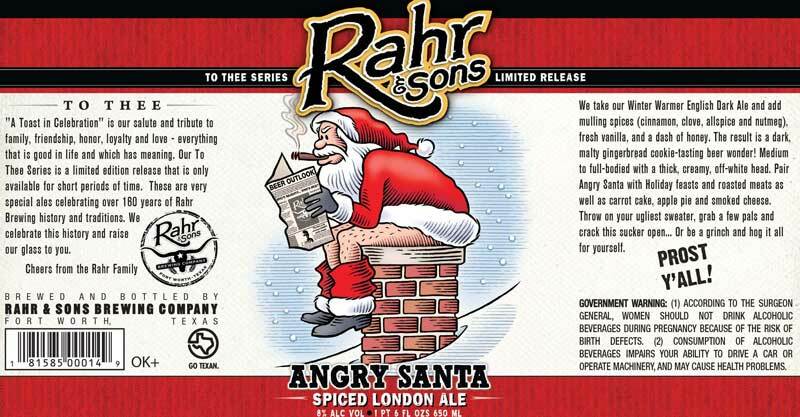 (Fort Worth, TX) – Rahr & Sons Brewing Co. will release two winter beers, Bourbon Barrel Aged Winter Warmer (BBAWW) and Angry Santa, at the end of this month. Both beers start with Rahr & Sons’ Winter Warmer – an English dark ale known for its savory notes of plum, raisin and chocolate – which then is brewed with different ingredients to create two beers with distinctive flavor profiles. BBAWW is aged in bourbon barrels, which results in a bold, yet balanced blend of toasted oak, English hops, dark fruit flavors and vanilla. An award winner at both the U.S. Open Beer Championship and U.S. Beer Tasting Championship, BBAWW is always a seasonal favorite and collector’s item; each year, the artwork on the label is updated, making it a unique gift idea for craft beer lovers. This year’s label features bright red, gold and silver metallic artwork that pops with a static hologram. BBAWW will be the specialty one-half pour beer on tap at the Wednesday, Nov. 23 brewery tasting. Angry Santa will be released commercially for the first time this year after Rahr & Sons received positive feedback from a small draft-only run last year. Mulling spices, fresh vanilla bean and honey are added to the English dark ale to create a dark, malty brew reminiscent of gingerbread cookies. Craig Mycoskie, Rahr & Sons’ vice president of operations, based the beer not on brewing books, but rather baking recipes. To celebrate the beer’s release, Rahr & Sons will host a tasting event at the brewery on Wednesday, Dec. 21. Angry Santa will be the specialty one-half pour beer on tap, and attendees are encouraged to wear festive outfits for the brewery’s popular annual ugly holiday sweater contest. Tickets are $10 and can be purchased at the door. BBAWW and Angry Santa will both be available in 22-ounce bottles and on tap around Dallas-Fort Worth. In early November, Rahr & Sons won a bronze medal for its fall seasonal release, Oktoberfest, at the European Beer Star Awards, an international competition held annually in Germany. Firestone Walker Brewing Releases Generation 1 from Venice Brewery Jester King Kvass Release This Friday!